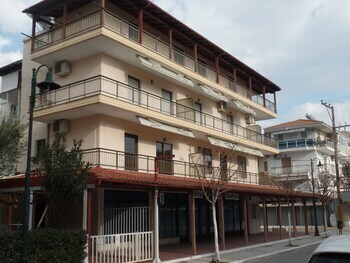 When you stay at Nebo Hotel in Katerini, you'll be near the beach and steps from Olympic Beach. This apartment is 2.2 mi (3.6 km) from Agia Fotini Church and 16.5 mi (26.5 km) from Ancient Dion. Make yourself at home in one of the 12 air-conditioned rooms featuring kitchenettes with full-sized refrigerators/freezers and stovetops. Rooms have private furnished balconies. Complimentary wireless Internet access keeps you connected, and satellite programming is available for your entertainment. Conveniences include coffee/tea makers, housekeeping is provided daily, and irons/ironing boards can be requested.